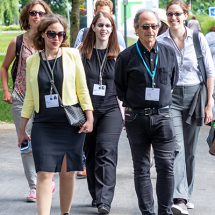 400 young scientists will soon make their way to Lindau. Of course, not all of them will become Nobel Laureates one day but taking a look at their work is still more than worth it. They will come packed with lots of new research ideas, interesting results and visions of their own careers in science. By way of example we would like to introduce the following four young scientists today: Gabriela Barreto Lemos, a quantum physicist from Brazil, Charlotta Lorenz, a physicist from Germany, Tyler Shendruk, a biophysicist from Canada and Sidiki Zongo, a physicist from Burkina Faso. 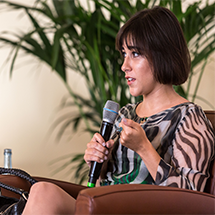 It is no exaggeration to describe Gabriela Barreto Lemos as a rising star in her field. 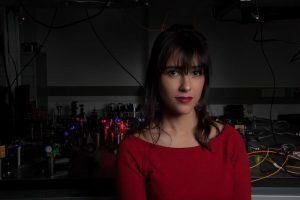 Now 33 years old, she already caused quite a stir back in 2014 as first author of a publication in Nature entitled “Quantum imaging with undetected photons”. 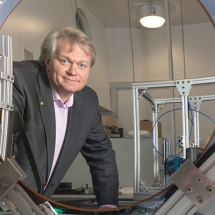 Anton Zeilinger’s team at the Institute for Quantum Optics and Quantum Information in Vienna, to which Barreto Lemos belongs, succeeded in generating an image with the help of light (photons) which, paradoxically, did not come into contact with the presented object. She explains the exact experiment set-up, which involved the use of two crystals as the sources of two photons, in a TED Talk. As fascinating as the result of the experiment is, the attentive listener will soon realise that what is involved here is something that far exceeds the limits of our standard powers of imagination. However, rest assured: Barreto Lemos also says that anyone who claims offhand that they can understand quantum physics actually proves that they have not understood it. The article by science journalist Elizabeth Gibney in Nature is recommended as an introduction to this topic. 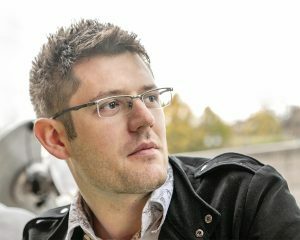 Tyler Shendruk has also gained public renown with his research, which has featured on the title page of the Biophysical Journal, and as a contributing Media Fellow of the British Science Association. The 33-year-old Canadian says: “Scientists have a responsibility to communicate their findings to the public” and puts this principle into practice in his blog. In his opinion, huge progress is currently being made in the physical understanding of biological systems, and he expects “to see an explicit simulation of the entire life-cycle of a bacterial cell within my lifetime”. 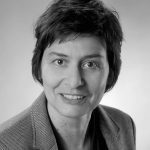 Charlotta Lorenz’s work is also interdisciplinary – her research topic is “Building a physical model of a biological cell through studies of dynamic networks”. Her research group aims to create a physical model that provides the most realistic description possible of the processes in a biological cell. 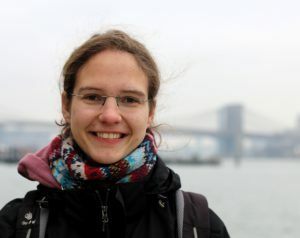 The 22-year-old completed her bachelor’s degree at the University of Göttingen and belongs to its “Nanoscale Imaging of Cellular Dynamics” research group. While still at school, Lorenz was also a student at the University of Oldenburg as part of the programme of support for gifted children. Her enthusiasm for physics is practically contagious and it is clear from what she says that she is open to many different paths and possibilities in her chosen field. When asked which projects she would embark on if she could choose freely, she lists the development of the quantum computer, a protein-folding simulation and a climate-change simulation that would enable the development of better solutions to the problem. Charlotta Lorenz is currently Visiting Graduate Student at the University of California in Santa Barbara and reports on her work and impressions there in her blog. Her project in Santa Barbara is “Cellular and cell-inspired network mechanics” and is supervised by Professor Megan T. Valentine. Lorenz can find many images that express the beauty of physics but also notes that “unfortunately, many people still react rather less enthusiastic at social events when I mention my subject of study”. That won’t happen in Lindau, we promise! Sidiki Zongo from Burkina Faso studied at the African Institute for Mathematical Science (AIMS) in South Africa. The 33-year-old works in the field of nonlinear optics (NLO), which is a sub-area of the optics of electromagnetic waves in physics. 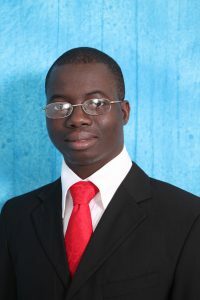 Zongo describes his research field as follows: “Nonlinear optics and photonics are two exciting, technological advanced fields in perpetual evolution with prominent applications in our daily life that more people should know”. For Sidiki Zongo science migration is a double-edged sword. How should young scientists in his home country be able to carry out excellent research if they lack the necessary technical resources? If the migration only works in one direction, conditions will not improve in the scientists’ countries of origin: “Recently it was reported in a newspaper that there are more African scientific migrants in US than scientists in Africa.” This makes it all the more important that initiatives exist like the one which aims to provide a laser light source in Africa; a corresponding resolution was adopted in Grenoble last year. Sidiki Zongo participated in this conference and met Francesco Sette, Director of the European Synchotron Radiation Facility (ESRF), there. Good luck to all the Young Scientists: Have fun and success with networking, talk shop with the other participants, exchange with like-minded experts around you. We are looking forward to meeting up with you!